Posted on November 29, 2018 by Hillary T.
Maureen Duffy, a member of the Wellfleet Bay Turtle Team, monitors a rescued Kemp’s Ridley sea turtle. And every year, staff and volunteers from Wellfleet Bay Wildlife Sanctuary patrol the beaches, rescuing these turtles. This year is no different. Since the season began earlier this fall, Wellfleet has encountered more than 630 cold stunned sea turtles. During the Thanksgiving freeze, when temperatures plummeted overnight, more than 220 endangered sea turtles stranded on Cape Cod. Wellfleet Bay’s dedicated team of rescuers patrolled the beaches day and night in search of cold-stunned turtles trapped in the surf, and had to deal with the full force of the weather for more than 48 hours straight. Of the 220, only approximately 50 were alive when rushed to the wildlife sanctuary’s turtle intake unit for weighing, measuring, and assessment. 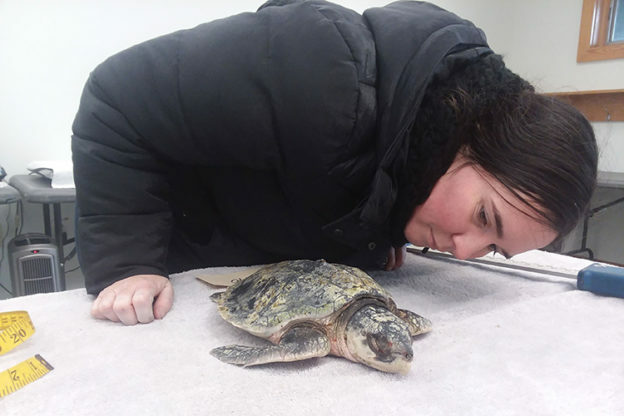 Volunteer drivers were lined up to transport the turtles to the Animal Care Center in Quincy operated by the New England Aquarium, Mass Audubon’s partner in this important rescue-and-rehabilitation mission. Typically, cold-stunned turtles rescued in November are still alive with a very good chance of recovery. But the unusual cold-snap produced conditions more common in late December when most of the turtles that strand are dead. Wellfleet Bay Wildlife Sanctuary Director Bob Prescott, who has been monitoring sea turtles for more than 35 years, notes climate change is causing more and more strandings. Back in the 1980s and 1990s, the water in the Gulf of Maine was too cold for sea turtles. But warming ocean temperatures have allowed sea turtles to enter the Gulf of Maine and some cannot get out before the water temperature drops. There’s still several months left in the season and the team on the Cape will be hard at work. Be sure to follow Wellfleet Bay on Facebook for the latest information. You can also learn more about sea turtles and how to support the Sea Turtle Rescue Project. This entry was posted in Nature Notes and tagged sea turtles, Wellfleet Bay on November 29, 2018 by Hillary T..